In the summaries of the proof, the inner polygon will be trapezoids ML + NQ + XO + triangle POG. The outer polygon will be trapezoids EM + MR + YX + TR + triangle PSG. The polygon on the curve will be trapezoids ME+ LE + QY +TO + triangle SOG. (diagram 1) 16. Again let there be a segment BQG enclosed by a straight-line and section of a right-angled cone, and let BD be drawn through B parallel to the diameter, and (let) GD (be drawn) from G touching the section of the cone at G, and let area Z be a third part of triangle BDG. I say that area Z is equal to segment BQG. (diagram 2) For if it is not equal, either it is larger or smaller. Let it first be, in fact, larger, if that is possible. The excess, in fact, by which segment BQG is larger than area Z, being composed itself to itself will be larger than triangle BGD. But it is possible to take some area less than the excess that will be a part of triangle BDG, Let triangle, BGE, in fact, be less than the mentioned excess and a part of triangle BDG (i.e., BGE measures BDG). But BE will be the same part of BD. (diagram 3) And so let BD be divided into parts, and let the points of the divisions be H, I, K, and let straight-lines be joined from points H, I, K to G. In fact, these cut the section of the cone. Since GD is touching it at G. And through the points where the straight-lines cut the section, let MF, NR, XQ, PO be drawn parallel to the diameter. But these will also be parallel to BD. 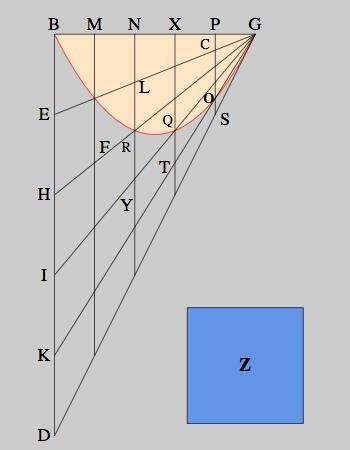 (*) (diagram 4) And so, since triangle BGE is smaller than the excess by which segment BQG exceeds area Z, it is clear that the areas together, area Z and triangle BGE, are smaller than the segment. (diagram 5) And the trapezoids are equal to triangle BGE, which the section of the cone goes through, namely ME, FL, QR, QO, and triangle GOS. For trapezoid ME is common, while ML is equal to FL and LX is equal to QR and CX is equal to OQ, and triangle GCP is equal to triangle GOS. (diagram 6) In fact, area Z is smaller than trapezoids ML, XR, PQ and triangle POG. (Prop. 13 and Prop. 14) And triangle BDG is three-times area Z. But BDG is smaller than three-times trapezoids ML, RX, QP and triangle POG, which is impossible. For it was proved to be more than three-times larger (Prop. 13 and Prop. 14). Accordingly, segment BQG is not larger than area Z.
Hypothesis: segment BRQG > Z = 1/3 triangle DBG. Let triangle BEG < BRQG - Z = 1/3 triangle DBG. Summary: Hypothesis: segment BRQG < Z = 1/3 triangle DAB. Let triangle BGE + segment BRQG < Z = 1/3 triangle DAB. 5. Hence, polygon on the curve + parabolic segment < outer polygon (2 and 4). (*) Archimedes does not mention that BM = MN = NX = XP = PG, but this is required, as it is assumed in the proofs of props. 14, 15. It is also the case. By Prop. 5, WR : RN = GN : NB. But RW : RN = DH : BH. So GN : NB = RN : DH, and so to for the parallel to the diameter at M, X, and P. So BM : MG = BE : ED, and BH : HD = BN : NG. Componendo, BE : BD = BM : BG, and BH : BD = BN : BG. Ex aequali, BE : BH = BM : BN. But BH = 2*BE, so that also BN = 2*BM, or BM = MN. (**) A note on the logical structure of the argument. From Props. 14 and 15, Archimedes uses the claim that 1/3 triangle BGD > the inner polygon in the first part of the proof and the claim that 1/3 triangle BGD < the outer polygon in the second part of the proof. He does not distinguish the two proposition so that this part of the theorem may be general. Also, this theorem does not employ a principle of the balance, only the results of previous theorems on the principle.